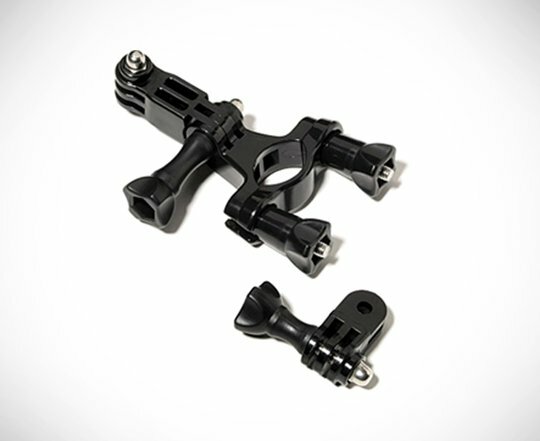 Included:|Bicycle Handlebar / Seatpost Clamp|Three-way Adjustable Pivot Arm|Attach your GoPro camera to handlebars, seatposts, ski poles and more. Fits 0.75″ to 1.4″ (1.9cm – 3.5cm) diameter tubes. You can also clamp to chainstays, small roll bars, bolt-heads, windsurfing and kitesurfing control bars, or even use to create a handheld boom – any pole that is in the size range above. Comes with pivoting orientation arms allowing for 3-way adjustability, ensuring you can get the angle you want.